Edited by Serge Prengel and Lynn Somerstein. If therapy is a relational process, it takes a person on the therapist's end. The goal of this book is to capture the therapist's evolving sense of self as it is shaped by our experiences as active participants in a creative interaction. 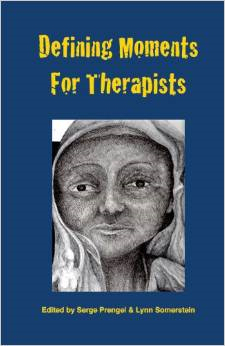 The essays of this book are first-person accounts, by eleven therapists, of some "Aha!" moments when they got to understand themselves better, and to understand better why they do what they do. Essays by: Cheryl Dolinger Brown, Mary J. Giuffra, Marianne Gunther, Lou Hagood , Claire Haiman, Robin Kappy, Linda Marks, Merle Molofsky, Marjorie Rand, Susan Rudnick, and Claire Beth Steinberger.